Todd Johnson is not a typical bass player. 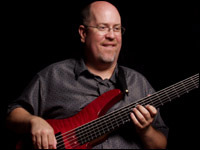 Few bassists have been accepted for their performance of traditional jazz music on electric bass and even fewer have become widely recognized for their contributions. On his latest project, a trio recording of straight-ahead jazz compositions titled Get Happy, Johnson continues his pioneering efforts on six-string electric bass alongside highly revered upright bassist/singer Kristin Korb. Originally from the state of Washington, Johnson has recorded multiple projects and performed at numerous festivals, concerts, and clubs throughout the United States as an integral component of the critically acclaimed Ron Escheté Trio since 1991. Through his distinct style, Johnson is capable of providing the roles of bassist, pianist, and seasoned soloist all at the same time. The Ron Escheté Trio has been repeatedly hailed by listeners as a trio that sounds deceptively like a quartet. While a student at Musicians Institute, Johnson studied under the guidance of notable bassists such as Gary Willis, Steve Bailey, Jeff Berlin, and Jimmy Haslip. Upon completing his studies, Johnson graduated with vocational honors and was presented the Outstanding Student award. As an instructor, Johnson has taught for over a decade at schools including Musicians Institute, The California Institute of the Arts, and is currently on the faculty of The Masters College. Johnson also demonstrates his techniques and concepts through clinics sponsored by Gallien-Krueger amplification and Yamaha basses. Along with his work as a long-time member of the Ron Escheté Trio, Johnson has performed or recorded with the likes of Mike Stern, Dave Weckl, Scott Henderson, and Frank Gambale to name a few. Over the past few years, Johnson has also appeared as a featured artist at bass events such as BassQuake and the Winter NAMM Bass Bash. In 2002, Johnson released, A Solo Offering, his debut recording as a solo artist. On A Solo Offering, Johnson revealed that his innovative approach to bass playing is anything but conventional. With his midi-equipped six-string bass, Johnson played bass lines, comped chords, and played melodies simultaneously on a collection of jazz-influenced, multi-tracked bass arrangements. In the following interview, Johnson talks with us about his brand new project with bassist/singer Kristin Korb, playing jazz on 6-string electric bass, chordal technique, studying at Musicians Institute, teaching, and much more! You have just recently released Get Happy. Could you tell us how this project came together and where it is available for purchase? A couple years ago, I started working as a solo bassist. I was doing solo gigs where I would use pre-recorded bass lines, a minimal drum part, and loops. After doing that for a year or so, I started to miss the interplay with other musicians. I was getting tired of having musical conversations with myself all the time. I enjoy playing solo, but I prefer to interact with other musicians. I approached the owners of a coffee house that I was gigging at, and they gave me a budget to work with so I could host a jazz duo series once per month. The great thing about living in Los Angeles is that there are a lot of great players to work with, and with the budget I had, I could bring in players like Ron Escheté, Larry Koose, Dewey Erney, and a lot of other great musicians. I had a great time hosting those duo gigs. 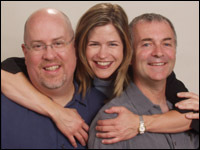 I answer the e-mail from the Ron Escheté Trio's website, and I received an e-mail from Kristin Korb thanking Ron after she had worked with him at Bud Shank's jazz camp. I replied to her e-mail and told her that I'd be sure to pass the information along to Ron. I had been hearing her name because there was a real positive buzz about her spreading around town. I visited her website and found out that her first recording as a singer was with the Ray Brown Trio and that really impressed me because I'm a huge Ray Brown fan and have been really influenced so much by him. Her second recording was with Jeff Hamilton and Mike Wofford who was Ella Fitzgerald's piano player for many years. Mike is one of the great piano legends living in southern California. Kristin was playing with some of the greatest jazz musicians around, and I had been hearing all of these great things about her. I thought a duo with Kristin would be really cool because she sings and plays bass so she could cover the bass lines, and I could play the guitar-like chordal parts on my 6-string bass. In my e-mail reply to her, I mentioned that I had this crazy musical idea and if she'd be interested in discussing it to give me a call. She called me, we talked it over, and she said she was game. Soon, she came to visit my family and we had dinner together. Afterwards, we went to a coffee house and talked about it some more. We discussed which tunes we wanted to do, the keys, and that was it. We were off and running from there. She plays great time, bass lines, and just sings her heart out. All I have to do is play the changes in the correct key, and I'm a hero. I've played with many great musicians over the years, and some of them have a real affect on a crowd. During one of our first performances together at a coffee house, I noticed that everyone just stopped what they were doing when she was singing. The place just became totally quiet. We had caught people's attention in there like I had never experienced before. Now, I'm not the sharpest knife in the drawer, but I knew we really had something special going. We were having so much fun playing together. She was really happy with the harmony I was able to play, and we were able to interact with each other really well. After that gig, we decided that we should set up some more performances so we started playing parties and clubs. Every time we had a rehearsal, we kept coming up with more ideas and soon decided that this project was definitely worth the time and dedication. We were receiving such good feedback from people that we decided we needed to do a recording, and now we are booking tours. Initially, Get Happy will be available through my website. Within the next couple months, it should be available at Amazon.com, iTunes, CD Baby, and many other online retailers. People will also be able to purchase the new recording at our live performances. Throughout Get Happy, you comp chord changes just like a jazz guitarist. Who influenced this style? I can answer that in two words: Ron Escheté. I've been a member of Ron's trio since 1991. Ron is one of the greatest jazz guitarists of all-time and one of the premier harmony players that you will hear anywhere. He just happens to play guitar. He's a harmonic genius. I've been very fortunate to have played with him all these years and have great voice-leading played at me for so long. After awhile, you learn how things are suppose to sound so when I started experimenting with this chordal approach, I already knew what the end result was suppose to sound like. I just needed to figure out how to emulate that sound on my bass. Because of the low range of the instrument, I'm a little limited to the number of notes I can stack on top of one another, but if you play the right three notes, you can imply a lot. Unless it's a melody note or a part of a moving phrase, I generally don't play many root notes in the voicings. Since Kristin is playing the bass lines, she is covering the root notes and fifths. If we are playing over a chord with an altered fifth, then I'll include it in my voicings. Most of the time, I'm playing lots of thirds, sevenths, ninths, elevenths, and thirteeths. Triads sound lousy if they start on the root. I also play lots of voicings using fourths. For example, if I play a D, A, and E barred across the 14th fret of my 6-string bass, I can imply several different chord changes. If you put an F below this voicing, you have FMaj13. If you were to play a C underneath, you would have CMaj6/9. If I move this same shape up to the 21st fret and play an A, E, and B simultaneously, I can imply a CMaj13 chord with the thirteenth on top. If I move this shape down by a whole step and play the notes G, D, and A, then I'll have a C6/9 voicing. I can imply many different voicings just by moving this concept around the fingerboard. There are some voicings that are real easy to play with just one finger like I've mentioned, and then there are other voicings that are real knuckle-busters. There are advantages and disadvantages to every tuning, and through experimentation, I've learned how to take advantage of the instrument's best attributes. The most important thing is to play what you hear and play things that are musical. There are times that I wish I had another string available on top so I could get extensions that aren't possible in some keys on a 6-string bass. I'm thinking about tuning my bass E-A-D-G-C-F or possibly even A-D-G-C-F-Bb. That could be fun, but I only have one 6-string bass right now so that wouldn't be practical at this point. Yamaha is in the process of building me a new bass and as soon as we get it right, I might have them build me another one so I can experiment with these different configurations. On Get Happy, I only used the low B-string on "Everything Happens To Me" because I recorded all of the parts. Kristin just sings on that song. 90% of what I play on the new recording is played on the D, G, and C strings. I'm literally a 3-string guitar player. To me, I think I sound like a diet version of Ron, and he has definitely been the biggest influence on my chordal playing. I've also listened to most of the classic jazz guitar players including Joe Pass and Wes Montgomery among others. Here in L.A., I've been influenced by the playing of Larry Koose and Frank Potenza. Some of these guitarists may not be nationally well known, but these guys have amazing talent. I've always said that if you are smart, you steal ideas from a lot of different people. If you steal from one person, you are a thief, but if you steal from 100 people, it's called research. With so many classic jazz standards available to cover, how did you finalize the tracks that appeared on Get Happy? Kristin and I have been playing together for about a year, and we started off just playing things that both of us knew. Right from the start, we agreed that we wouldn't play anything that we didn't like. Since we recorded the new project, we've added many more new songs to our repertoire. The songs that we recorded were all tunes that we really liked at that time. Most of them are classic jazz standards, and we also added a couple original compositions. The two songs that I contributed were my first attempts at composition. One of them is a blues tune, and the other one is sort of a 16-bar blues with turn-arounds. I figured that since everyone else writes tunes, I might as well try writing tunes too. We genuinely liked all of the songs that we recorded for the project. I think we chose tunes that we liked to play and songs that the listener will enjoy as well. I think there is a fine balance between artistic integrity and pleasing the audience, and I think we were able to accomplish that balance. Can you tell us about the gear you used to record Get Happy? What equipment are you using for live performances? Kristin has a beautiful 100 year-old bass that we simply recorded by placing a microphone in front of it. We tried a few different microphones before choosing the best one for the project. I plugged my Yamaha 6-string bass directly into a rackmounted preamp that was at the studio with all the controls set flat. We added just a little touch of compression and reverb, but we didn't need to do much to our sound that is different from what you will hear live. The biggest issue that we had to deal with was making sure that we were all out of each other's frequency field. We didn't want the signals from Kristin's upright and my 6-string bass to become too mixed. We had to eq Kendall's bass drum a little because it was cross-cancelling Kristin's frequency. Both Kristin and I are Gallien-Krueger endorsers. We are both playing the Neo112 cabinets. Kristin is using the MB150 head, and I'm using the 1001RB head. I've always been a big fan of having lots of headroom available. I'm very happy with this amp and thrilled with the cabinets. The cabinets are ultra-light. The Yamaha 6-string bass that I've been playing for years was actually one of the John Myung (Dream Theater) signature series prototypes. It's a tremendous instrument. It has an alder body with a maple neck and ebony fingerboard. My bass is slightly different than the production model because I wanted the fingerboard to have more of a radius to accommodate my chordal playing. I've never cared much for flat fingerboards, and I like the feeling of a curved fingerboard. At the time the bass was built for me, I was using the Yamaha midi system and blending in a lot of Hammond B-3 sounds on the top three strings when I performed with the Escheté Trio. I was looking to have the Buzz Feiten tuning system installed on that bass, but Yamaha approached me with an easier alternative called the Fret Wave. With this tuning system, you will notice a couple of "bent" frets on my D and G strings. If you do a lot of chordal playing like I do, this tuning system really helps. As much as I like the musical benefit of this system, I'm tired of being asked about why some of my frets are bent. I've been using GHS Progressive strings (.136, .106, .085, .065, .045, .030) since they came out. When I was studying with Gary Willis, I was using a lighter set of strings, and his strings just sounded so much better. Even though they were heavier strings, they were really easy to play because Gary's bass was set up properly. If you want to have a really good sounding B-string, you have to have a thicker string. I see guys playing basses with low B strings that are .120 or .125 and complaining that they have a terrible sounding B-string. Well, duh. More mass means more sound. Who were your earliest influences? Who inspired you to play the 6-string bass? Ray Brown was my first real influence. I was outside practicing basketball when I was 15 or 16 years old and my mom called me inside the house because she was watching the Merv Griffin Show which featured the Morton Lindsey Orchestra. It was an incredible band and included famous jazz musicians such as Ray Brown and Herb Ellis among others. I was a tuba player in high school, and my mom knew that I liked bass-related things. Ray Brown played and I thought his playing was the coolest thing I had ever heard in my life. His playing had a really profound affect on me. I found an upright in a closet at my high school, took it home, and located a guy who tuned it and set it up for me. I took a few lessons and worked during the summer in order to buy my first electric bass and amp, a Hohner 4-string along with a Fender Bassman 50 amp. I played upright for six or seven years but found it impossible to keep one on the road with me. I was studying with a local orchestral bass player in Las Vegas. I'd study with him, and then I'd have to go on the road for several weeks doing gigs with my electric bass, lose all my upright chops, and then return home to start all over again on upright. I was having a really hard time keeping my bass glued together in the desert. The desert heat just sucked all the life out of my upright, and I just kind of drifted away from it. About that time, 6-string electric basses started to appear in music stores. This would have been around 1989. I purchased one and started experimenting with it and soon realized that the 6-string electric bass was my instrument. I played a 4-string electric bass exclusively for four years. I then played a Yamaha 5-string bass for five years, and I've been playing the 6-string since 1989. My first 6-string bass was a Heartfield made by Fender. I also had an Ibanez 6-string for a short time before I became endorsed by Yamaha in 1995. At that time, I think the only 6-string bass that Yamaha made was the John Patitucci model, and the string spacing on that bass was really wide. It's a fantastic bass, but I really wanted a bass with a narrower string spacing in order to make it easier to do the chordal playing. John Patitucci was the first 6-string player that really influenced me. I was playing in a Top 40 band in Singapore for a month, but we had a night off when Chick Corea's Elektric Band was playing. We went to the show, and I saw Patitucci play. It literally crippled me. Patitucci's playing totally inspired me and totally depressed me at the same time. After hearing him play, I thought why even bother. Why should I even bother playing bass after hearing someone like that? It messed me up really bad. After I recovered, I was so inspired because I knew I couldn't play like that, but it gave me something to shoot for. I thought that I'd never make that level, but if I didn't start working at it, I would never get there. When I first picked up a 6-string bass, I realized there were a lot of possibilities if I could only figure out what to do. How have you overcome the challenges of muting your 6-string electric bass? The secret to successfully muting a 6-string is through the floating thumb concept. I was fortunate enough to study with Gary Willis at B.I.T., and he introduced me to the floating thumb technique. I don't use Willis' three-finger right hand technique, but I do think it is the most brilliant right hand approach. I do a two-finger version of Gary's three-finger technique. Most bass players anchor their thumb on a string or a pickup and then drop their elbow placing a lot of pressure on a bent wrist. You have much more power available if you keep your wrist straight. You would never pick up heavy weights with bent wrists. Keep the forearm in contact with the body of the bass, and don't drop the elbow. When your thumb is floating from string to string, it will be lightly touching and therefore muting the strings below the one you are playing on. It's such a simple concept that it is almost irritating to see bassists not using this technique. The floating thumb is the key component to muting, and Willis introduced that approach to me so I have to give him all the credit for that. During our lessons, Gary would reach over and touch the low strings every time they would start to ring. Every time I would start to solo, my B and E strings would start ringing, and he was constantly reaching over and poking them. I eventually got to the point where I was always aware of the problem and was forced to fix it. It was very humbling for several months, but I knew if I didn't fix it, I would have problems with ringing strings forever. Your 6-string bass was equipped with a midi pickup that allowed you to play standard bass lines on the B, E, and A strings while you comped chord changes and played melodies on the D, G, and C strings using organ tones produced by a midi interface. Do you still use the midi technology in your performances? I utilized the midi technology for five or six years, and I just felt like I had done all that I could do with it. When I used it as an accompaniment tool, it worked really well. We installed a Yamaha midi pickup and disabled the bottom three strings. I didn't need the midi technology to play bass parts because I wanted to play them with a clean tone. I didn't want to play synth bass parts. I wanted the midi capability to generate other tones. When I play the bass lines and chordal accompaniment at the same time, I visually separate the instrument into a 3-string bass and a 3-string guitar. I used a Hammond B-3 module and a Yamaha sound module, and it worked great when I played bass lines and chords. When I started working as a solo act, I was playing 3-string chord melodies and making wider leaps which led to tracking problems with the midi setup. I just felt like I couldn't allow the midi technology to interfere with the musical development. The midi gear can really make playing different things enjoyable, but I'm really happy to be back to the sound of the 6-string bass. If you listen to the tone of my 6-string bass, it does have a lot of organ-like qualities in it. The new bass that Yamaha is designing for me will have a split pickup that will allow me to use different effects on the top three strings while keeping the bass tone clean on the bottom three strings. I can happily play an entire gig with just bass tone, but it's nice to have some timbre changes throughout the gig. That is the direction I'm headed in right now. If the midi gear was flawless, it would be much more appealing. Plus, if I don't use the midi technology, I have much less equipment that I need to take to gigs. Now all I take to gigs is my bass, a chord, a reverb pedal, and an amp. To set up for a gig, it is one trip in to the venue, and when the gig is over, it is one trip out to the vehicle. It doesn't get any easier than that. Do you find that people are reluctant to accept the sound of electric bass in legit jazz settings? I seem to be less and less bitter about this the older I get. Maybe I'm just becoming more secure in what I do. I love upright bass. I've transcribed so much of Ray Brown's playing as well as Paul Chambers and Todd Coolman. These are upright players that I just admire deeply. Jazz pretends to be an open-minded, forward-thinking style of music, but for most fans of jazz music, if it isn't upright then it isn't jazz. In all fairness to these fans, most electric bass players don't play electric bass like a jazz instrument. They play it like a rock instrument. They play it far too hard. You can really beat on an upright because it doesn't have frets. It doesn't sound as harsh as when an electric bass is played with a hard attack. Years ago when the electric bass first became popular, many upright players purchased a Fender bass. Then, when their upright bass was in the shop, they would pull the electric bass out of the case because it was tuned the same and was somewhat similar. The problem was that these players would play it the same as an upright. It takes much more physical strength to play an upright than an electric bass, and they would play it really hard like an upright. The frets would start to buzz, and it just sounded horrible. As a result, jazz fans just learned to hate the sound of electric bass in jazz music, and I can't really blame them. I love traditional jazz. If it's played well and played musically, I would hope people would be open to the electric bass in a more traditional setting. I think it's also the electric bass player's responsibility to learn to play the instrument with some emotion, and don't articulate everything by the bridge pickup like Jaco did. It doesn't work well on a jazz gig. That works great when you are soloing, but play closer to the neck for a warmer tone and to better compliment the music. I wish electric bass was more accepted in traditional jazz. The electric bass has evolved so much in its 50 or so years of existence. It's physically easier to play, and it is much easier to play in tune than an upright. It's much easier to maintain than an upright because you don't have to worry about it coming unglued. It's easier to transport, and it records better too. With all this being said, I still love the sound of an upright. You utilize an innovative technique where you play bass lines, chord changes, and melodies simultaneously. How did that approach develop? In 1989, I enrolled at B.I.T. to study with Gary Willis, Steve Bailey, Bob Magnusson, Jeff Berlin, and all of the other great players that were teaching there at that time. It was there that I saw Ron Escheté play bass lines and harmony on a 7-string guitar. Before I had met Ron, I knew it was possible to do this on a 6-string bass, but I just didn't know what to play. One day, Ron and I got together and he asked me if I could play an F7 voicing with the third and seventh on the high strings while playing an F on one of the lower strings. Then, he wanted me to move the third and seventh of F7 down a half step and find a low Bb to play a Bb7 chord. When I went home, I figured out how to play an entire F blues using just thirds and sevenths. During our next session, he wanted to see what I could do on "Autumn Leaves." He was very encouraging. He told me that as long as I keep thirds and sevenths in my chords, he didn't really need anything else. After a couple sessions, these ideas started coming together. Ron started playing polychords on top of what I was doing, and the room just started to spin. It was very exciting. It started with a blues in F and countless hours of hard work. Now, I can do all these things simultaneously without having to think about it. In much of jazz music, when it comes time for the bass solo, everyone splits to go have a smoke. Both Ron and I have always disliked that about jazz. The bass player is supporting everyone during their solos, and then they just quit on the bass player when it's time for the bass solo. Since I can play bass lines, harmony, and melody at the same time, I can accompany myself during a bass solo. For those bassists wanting to experiment with your unique chordal concept, how would you recommend assimilating these techniques into their own playing? First, you need to have at least a basic understanding of harmony. You need to learn how chords are constructed. This seems to be a real problem for many bass players because they can build chords on paper, but can't figure out how to put them together on their instrument. I learned how to play chordally by learning theory and harmony. Through Gary Willis' fingerboard harmony method and some exhaustive studies consisting of arpeggios and scales, I learned how to use the entire fingerboard. I know where all the information is located. I discuss this in my clinics. You have to understand the basics of walking line construction and strong beat/weak beat theory if you are going to comp chords and play walking lines simultaneously. It's also important to know how things such as tritone substitution work. Once you have these things figured out, it's just a matter of investing the time to put it all together on the fingerboard and committing it to muscle memory. If you only learn this chordal approach as a trick, that is all it will ever be, and you are going to get stuck. You won't be able to transpose it or apply it. If you learn theory, harmony, and your fingerboard, then you can put this chordal approach together and do it in a musical fashion rather than using it only as a trick. For me, the most difficult part of learning how to play in this manner was in trying to produce a good sound with my right hand thumb when I was playing walking bass lines that was consistent with my two-finger pizzicato technique when I was comping chord changes. Gary Willis got me to lighten up my touch, and that really helped me. I don't play as light as Willis, but my right hand attack is still really light. You can't dig in with your thumb or it just sounds terribly uneven against the chordal material. Your hands need to work independently of each other as well. Try to play a root note and fifth with your thumb and a 3/2 clave against it. Your index and middle fingers on your fretting hand will be playing the root and fifth with one rhythm on one side of your brain and then your index and middles fingers on your pizzicato hand will be playing a totally different rhythm on the other side of your brain. Guitar players have been doing this for a long time so I knew it could be done. You have to be careful when playing three-note chords and bass lines at the same time because things tend to become muddy due to the register, but you can comp 9th, 11th, or 13th chords every four or eight measures to create the illusion that your are outlining more harmony than you are really playing. I try to cover as many thirds and sevenths as I can because if you are playing with a guitar player or pianist, they will add alterations such as #5, #11, b9, #9, etc. As long as you are playing the correct thirds and sevenths, you can't get in anyone's way harmonically. This approach allows the soloist much more canvas to paint on. In your own studies, what do you spend the most time practicing? I spend the majority of my time working on chord melodies. I've been going back are re-learning songs that I already know as single-note songs and playing them as chord melodies. I've also been spending quite a bit of time transposing jazz tunes to keys that they normally aren't played in. By accident, I have discovered through working with Kristin that many of the keys that work well for her vocal range also tend to be the optimal keys to play them on my bass using chord melodies. I've been learning a lot of melodies. If you want your playing to sound melodic, learn as many melodies as you can. How have you committed so many jazz tunes to memory? Do you have a formula that you follow when learning a jazz composition for the first time? First, I analyze all new jazz tunes in terms of numbers and distance. For example, let's break down the first few measures of the jazz standard, "All The Things You Are." The chord changes include Fm7, Bbm7, Eb7, AbMaj7, DbMaj7, G7, and CMaj7. I approach the beginning of that song as 6-2-5-1-4 then move up a tritone for 5-1. I then continue this same process throughout the remainder of the song. This method is an easy way of memorizing a lot of tunes through numbers, function, and distance. If you memorize tunes in this fashion, then transposing the entire song form to other keys is really simple. I just create a harmonic template for the song, and then plugging it into another key is a piece of cake. It's like memorizing a phone number but with sound attached to it. This is how all the old-timers did it. If I had to take each chord change and transpose it independently of the surrounding chord changes, I'd have a stroke after four measures. Of course, you want to learn the melody as well. That is very important for your melodic playing. I also learn how to harmonize the melody. When you analyze the chord changes, you want to assign the proper scales and arpeggios to that particular chord type. With practice, this becomes an instant process. You will eventually reach the point that when you hear a chord being played, you will be able to immediately recognize it. If you can learn to recognize a person's voice on the phone, then you can learn to identify different chord types. If I had never spoken to you and called you on the phone, you wouldn't know who you were talking to, but if I called you several times, you'd learn to recognize my voice instantly. The same thing holds true in learning chord types. After you hear them enough, you will be able to differentiate between the chord types. With my Boss RC-20 loop station, I can loop a bass line and then practice playing melodies, chords, and chord melodies over the top of that. I'll also take my old Jamey Aebersold play-alongs, and instead of panning out the bass part, I'll pan out the piano and practice playing chords and chord melodies on that. What were among the most important concepts you were able to learn from all the great bass instructors as a student at Musicians Institute? Jimmy Haslip is one of my heroes and dear friends, and I have noticed a few Jimmy-like things that I've assimilated into my own playing. In my lessons with Jimmy, he just really confirmed that I was on the right track and that I should keep doing what I was doing. Of course, I learned a lot from Gary Willis, and I also picked up a lot of really cool things from Bob Magnusson who is a great west coast upright player from San Diego. Bob turned me on to listening to the great recordings such as the Wes Montgomery/Wynton Kelly Trio's Smokin' At The Half Note and got me into the great jazz rhythm sections. I listened to that particular recording so much that I could sing every solo on it. Bob taught me when to play in two and when to play in four. He showed me how to play into a solo and how to exit out of one. He really got me listening to all the nuances. I'm really indebted to Putter Smith for teaching me how to read. I was able to read before studying with Putter, but he really gave me a solid method. One of the most significant things that I learned was how to learn and how to practice from Howard Roberts, a great studio guitar player and actually the musical founder of Musicians Institute. He showed me the difference between muscle memory and data memory. You can only input so much before you get full. For example, if you are going to pour a cup of coffee, at a certain point that cup will become full. You can continue to pour coffee into that cup, but you aren't going to get any more in it. If you are trying to memorize tunes or a few measures of a Bach cello suite or whatever, you have to allow yourself a break. Many musicians will practice non-stop for hours, and then the next day they pick up the instrument and can't recall how to play what they were practicing the previous day. They forget this information because they were full. Howard showed me that I could learn more thoroughly if I would take short breaks while practicing. If I have an hour to practice, I'll play for 15 minutes and then take a 5 minute break. Then, I'll practice another 15 minutes before taking another 5 minute break. Within the span of one hour, I will have practiced for 45 minutes and taken short breaks for a total of 15 minutes. These short breaks allow my brain some time to recuperate before continuing. You will retain more information through this practicing method. If you were to practice for 4 hours without taking these breaks, you aren't going to retain that much past the first 30 minutes. If you are going to waste 3 1/2 hours, you might as well just watch Oprah or Dr. Phil. At a certain point, data memory has to become muscle memory, and there are no shortcuts to learning muscle memory. The biggest problem in studying music is that many musicians become discouraged long before the data memory becomes muscle memory. If you recognize the difference between data memory and muscle memory, you will have more confidence because you know that you are doing the correct things and you just have to keep pursuing it. When learning new music or working on really challenging things, I try to practice early in the day when my cup is still empty. Later on in the day, I then work on smoothing things out using muscle memory. I'm really able to maximize my practice time with this method because I've learned how to become really efficient with my time. Today, you are an instructor at The Masters College and you also conduct clinics sponsored by Gallien-Krueger and Yamaha. What areas do you stress the most in your teaching? The biggest problem that I see occur repeatedly from clinic to clinic is that most bass players anchor their thumb on the pickup or E-string. There are people at varying levels of playing ability in clinic settings, but I've found that practically everyone can benefit from the floating thumb demonstration, and I really try to spread the word about the floating thumb technique. Most bass players don't know how to get a good sound out of their hands. They play entirely too hard and the strings on their bass are constantly ringing. The floating thumb technique helps even advanced players in cleaning up their sound. I also have a handful of technique exercises that I'll show them. If I'm teaching a more advanced audience, we may also get into some of the chord melody playing and soloing. It's actually pretty rare that I get to discuss playing bass lines and chords simultaneously. If I start talking about this subject in a clinic situation, most people's eyes just glaze over after about 30 seconds and I've lost them. While a lot of people like to watch me playing in this fashion, it's just way too much for most people to absorb. I spend the majority of the time just teaching basic nuts and bolts bass playing because that is where the greatest need seems to be. I have a great walking bass method that I've refined over the years, and I usually talk about it quite a bit. I also try to get the audience to take the bass player oath too. I make them raise their right hand and repeat after me, "I, (state your name), promise to play the root and fifth and lock with the bass drum so help me God." I have people do that all over the country. Although the chord melody playing is really fun, I can't stress enough how important it is to become a great bass player first. Nobody is going to hire you to do the things that I do such as the chord melody playing. I would never have had the opportunity to do any of this now if I had never learned how to play bass and function as a supportive member of a rhythm section. I can't stress this enough to beginners. Don't be afraid to play the root of the chord on the downbeat of chord changes. This is what band leaders want you to do. Regardless of the style of music that you are playing, lock into a groove with the bass drum. Learn to become a complete musician. I'm always telling people to put the machine gun-style thumb slapping away and learn to play because you will never use that in a band that pays you money. I'm not saying that you shouldn't learn to play with your thumb, but don't devote so much time to it because there won't be many occasions that you have the opportunity to use it. Rather than spending the time on learning to use your thumb, learn melodies, learn how to read, and study harmony. As much as I want to encourage people to take the instrument to another level, you have to be able to function within the role of a bass player first. Kristin and I are currently performing as a duo on a three-week west coast tour that will take us to Washington. When we return from the tour, we will have a cd release party towards the end of October and a concert at The Masters College. Kristin and I will continue to plug this new recording for the next year. Ron Escheté just finished mixing our new live trio project which we recorded at Spazio, a great jazz club in the San Fernando Valley. It's called In The Middle, and it should be available by the end of this year or early 2005. It will be the best representation of what Ron, Kendall, and I sound like in a live performance. Eventually, I want to do another solo recording and also a project consisting of duets such as me with a singer or me with a guitar player or me with a pianist or horn player. I think I could present some interesting configurations. I'll also be doing clinics for Gallien-Krueger and Yamaha. At some point, I really need to put a book out too. When you are not playing bass, what do you enjoy doing? I'm really a family-oriented person. My wife and I are Christians, and we are active in our church. I absolutely love to fish. I'm a lousy fisherman, but I love to fish because it is so quiet. During the summer of 2003, my wife and I took a vacation to northern California, and we hired a couple of professional bass fishermen. One day, we caught over 100 large mouth bass. I don't get to fish very often, but it's great therapy. I really enjoy it. I'm a sports fan in general, and I've always enjoyed basketball. I've been a Lakers fan for a long time. I also have a new bad habit called iTunes. I've recently discovered iTunes, and it is an incredible jazz resource. The bad part about it is that I sit in front of my computer and spend more money than I have. What advice could you offer our viewers who are trying to take their playing to the next level or make bass playing their career? Get an education. Find the best teacher in your area that you can afford. After you have a good understanding of fundamental bass technique, don't feel that you have to study with a bass player. It doesn't cost that much to attend a community college anywhere across the country. Learn to read music. There are so many more opportunities that will be available to you if you learn how to read. Learn music history, theory, composition, and arranging. Play in as many different bands as you can. Learn as much as you can about music. Don't just learn tricks. It is much more important to get a good education than it is to buy really expensive basses. If you don't know what to play on your bass, buying a new one isn't going to fix that. Don't feel like you have to attend a big-name school to get a better education. Many people believe they are going to become better musicians by going to a well-known school, but it is still up to you to do the work. You can save yourself a fortune by just going to an in-state school to study and working really hard. Most of the information that you are going to learn is basically the same no matter where you go to school especially in the first couple years because it's all basic information that everyone should learn such as theory and ear training. Why pay $40,000 per year to go to a big-name, out-of-state university when you can go learn the same material for $1,500 at a local community college? The music industry is a business of making contacts and getting gigs through word-of-mouth. Go study at a community college for a couple years, and create relationships with the teachers and students. Then, go to a different school for a couple years and make a whole new set of connections. When you are done with school, you will have twice as many contacts that you can take advantage of when you are trying to make a living playing music.